Childhood pets weren’t a part of my life, Granny being the fastidious clean-freak that she was. But I’ve more than made up for that deficiency in recent years. Mitzie moved here in 1885 with her owner Peter Vandervort. She was ten years old at the time and I became her step-parent for ten years more. You do the math. Miss Mitzie never weighed more than eight pounds; at the time of her death she weighed only six. Blind, deaf and nearly toothless, we learned to read the range and tenor of her bark: “Pick me up.” “Put me down.” “Take me out, let me feel the grass and smell the dirt so I can relieve myself properly.” “It’s time to eat, please.” I can’t reproduce the sounds she made—I lack her nuance and subtlety—but her requests were clear enough. Was it selfish to keep her with us so long? A landscape student asked one day if we had a Shih-Tzu. I said “Yes, technically a Shih-Tzu/Poodle.” So, very soon we inherited an elderly Shih-Tzu, the student’s grandfather’s dog; a farm dog, no less. Can you believe it? A Shih-Tzu on a farm? Max came with a name and a host of medical problems: beneath a carpet of hair matted from months of no grooming we found a shy little fellow with a tumor on his left eyelid, a fibulating patella on his right rear leg, a level-3 heart murmur and the unnerving tendency for grand mal seizures at the least convenient times. Max required four medications three times a day, several of them what humans take for the same afflictions. We gave Max two better years than he otherwise would have had. One day at Petco’s checkout, we chatted with someone who had found a stray dog that she couldn’t keep. Later that week, we welcomed a large Cocker Spaniel sans name, but his size and propensity for being in your lap very soon christened him Mister Moose. The very night he arrived, after Moosie had settled in on the bed, a drunk walked into our kitchen through an unlocked back door. The dog sprang into action defending turf that had only been his for a matter of hours. We knew that Mister Moose belonged. In the meantime, a puffy grey cat began sunning on our deck. She seemed homeless, so dry cat food was added to the grocery list. Lingering over her bowl one day, I invited Missy Kit into the kitchen. Glancing up at me, she strolled in, did a long thoughtful analysis of the current menagerie and decided to settle down. “I can handle this motley crew” was written all over her face, which only confirmed her new name, a reference to the “Gunsmoke” character Miss Kitty (played by Amanda Blake), proprietor of the Long Branch Saloon. Missy Kit developed kidney failure and left us on terms other than her own. Somewhere along the way, I did a year of graduate work at the University of Texas at Austin and adopted a Lhasa Apso named Rambo. Who would do that to a dog? Behaving more like a Scots Presbyterian than Sylvester Stallone, he soon earned the name Angus and flew home with me at Thanksgiving to join the other three. Milton Yergens used to watch me from his old office window walking the lot of them. “Die unendliche geschichte,” he would chuckle, describing the sight of three such mismatched dogs (8, 16 and 25 pounds) and a cat running along beside, squatting where the dogs relieved themselves. I honestly believe Missy Kit thought she was one of the pack. Ultimately each of them left us, buried by the back porch in ground I consider as sacred as any cemetery. Clumps of hosta mark each of our five old friends, but we couldn’t stay pet-less for long. Lillie, another Shih-Tzu, and Bob the Tabby cat—handsome fellow; refugee from a neighborhood apartment house fire—constitute the current family. They too will leave us when the time is right (though it never is); they too will find space by the back porch. And they too will be followed in due course by other rescue animal companions. I write this simply because we lost another good friend today: Eddie, boon companion of Cindy, Mark and the Divine Miss Emma. The void in their home is huge and sudden, though not unexpected. All I can say is that Eddie’s place in their hearts and ours is sure. Eddie fought the good and worthy fight. If there is a lesson I’ve learned from our companions, it’s this: Don’t let saying goodbye to an old friend deter you from saying hello to a new one. Technically this is just a footnote to the previous entry concerning degrees of separation and my suspicion that six is way too big a number. It had been listed on eBay roughly twenty minutes before I encountered it in my daily search pattern. There was a “Buy It Now” option that was only $6 different than the opening bid amount. Though I didn’t know it at the time, the artist had been a student at the Ecole des Beaux Arts in Paris, premier European architectural program at the time. Hebrard had emigrated to the U.S. and taught at several prominent architectural schools–none of which I can claim as an alma mater. At one of those schools he taught a young Swedish student named Raoul Wallenberg. Wallenberg was called back to Sweden during the years leading up to World War II and pressed into diplomatic service, rather than his chosen architectural career. Stationed in Budapest, Wallenberg was instrumental in the salvation of 1800 Jews who travelled to neutral Sweden with forged transport papers he provided. When the Russians took Hungary, Wallenberg was arrested and disappeared from the sight of mankind. He was never seen again and is presumed to have died in a Russian gulag. The last day that Wallenberg was seen publicly was 17 January 1945. I was born on 17 January 1945. 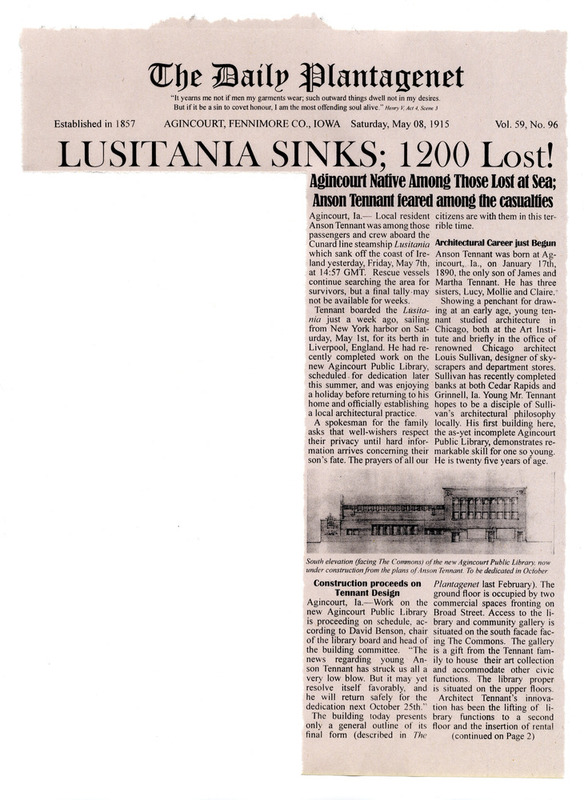 I rummaged in my files for some references to the sinking of the steamship Lusitania on May 7th, 1915. (There’s plenty available on the internet; see, especially http://www.lusitania.net). Ordinarily events like this tragedy don’t strike home; they manage a detachment from our lives and seem always to have happened to someone else. Here is a piece from the front page of The Plantagenet belying that detachment. Newspapers don’t always portray what was actually going on, however. Reading between the lines and knowing some senior members of the extended Tennant family, I sense that the community rallied to insulate them from outsiders, especially members of the press who had descended upon us from Sioux City, Des Moines and even as far as Chicago in search of something juicy. Are the press doing us a favor by trying to put a face on the abstract? The search dragged on for weeks but there was still no word of Anson. Perhaps it was the lack of a recovered body that allowed them to hope. “Out of sight is out of mind.” “Absence makes the heart grow fonder.” Which do you prefer? Growing up on the southwest side of Chicago, I saw a handful of tornadoes. The “Lake Effect” brought them out of the southwest and then swung them around through the southern suburbs into the dunelands of Indiana and Michigan. The sky turned the sickly green of old bruises; the clouds, bumpy-lumpy with a hundred cosmic insect bites. Then came that indescribable locomotive sound. At worst we lost a few mature trees and incidental damage from falling limbs. We were lucky. The fifth worst tornado season in the history of the U.S. Weather Service brought all this back to mind. We need to make sense of natural disasters that strike without warning—tornadoes, hurricanes, earthquakes, tsunami and tidal waves. But when reason fails and our powerlessness is clear, other answers tend to come from those who speak for God: Pat Robertson, the Assistant Bishop of Linz, Messrs Limbaugh and Beck. Whether hurricane Katrina, the earthquake in Haiti or Japan’s tsunami, there were clergy aplenty to claim “divine retribution” for some infraction of the rules: for tolerance of Gays or abortion or stem cell research or Secular Humanism. The clergy I know in Agincourt are of the Liberal sort—friends of Howard’s mostly—who’ve probably responded with prayers for the injured and collections for relief. A few of Agincourt’s citizens will even have volunteered their medical, carpentry and other useful services and skills. I don’t yet know the clerics of a more conservative bent, however, but I know they exist; those inclined to see the loss of property and life in the Deep South as punishment from a righteous and vengeful God. But Alabama is arguably America’s most conservative state. So it’s curious why the blogosphere has been relatively silent this time. Disaster in New York City or San Francisco would have elicited predictable rationales; likewise for foreign climes not yet harvested for Christ. At some point I’ll have to admit my minority point of view. It won’t be easy.